Is it a bird, is it a plane, is it something else entirely ungodly? We’ll go for the third option here. It was Midwinter Christmas and, following a decision a few weeks earlier and most likely assisted by the fine beers available at Goldings Freedive, Turducken was the dish of the day. 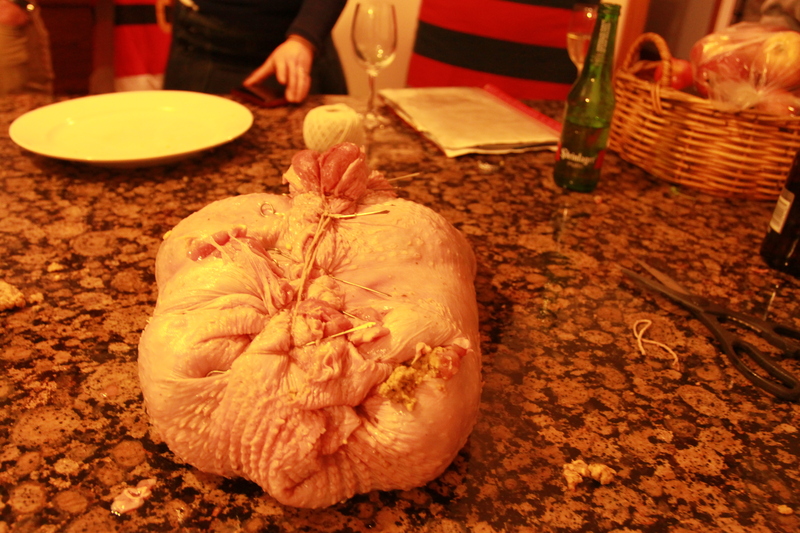 I like to think of Turducken more as a Frankenducken. 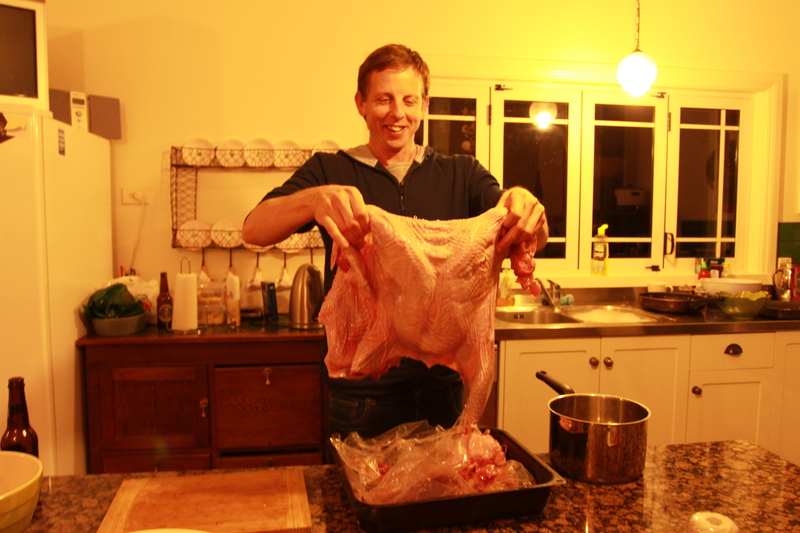 An unwitting turkey becomes host to both an entire chicken and, in our case, four duck breasts, evolving into a bulging meat sack that is neither bird nor beast, but is definitely dinner. I have to say our Frankenducken may never have got off the ground (so to speak…sadly for all birds involved, their flying days were well and truly over) had it not been for the wisdom and generosity of YouTube, in particular this aptly named ‘How To Make A Turducken’ clip by Armand Ferrante, who happened to be crowned Wholefoods Best Butcher in the US in 2012. And thus, all research was completed, the de-boned and de-frosted poultry was collected from the butcher, a poultry lacer was purchased, and the hour of truth had arrived. 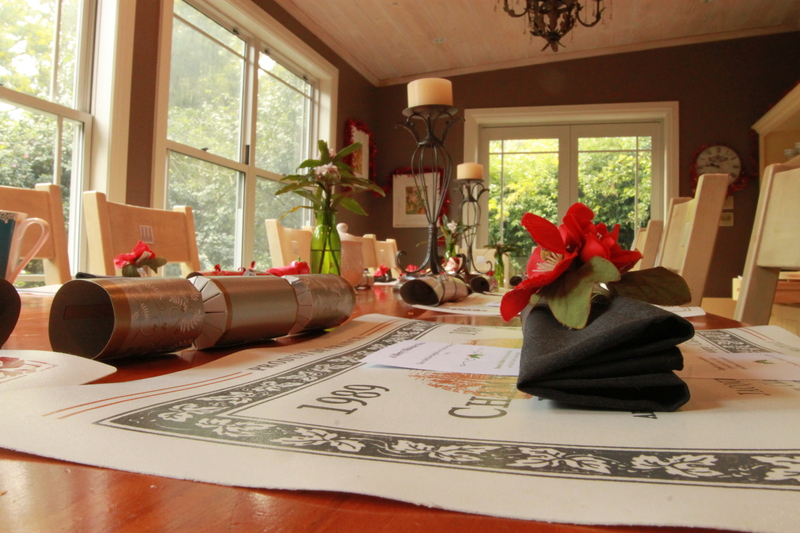 Our merry Mid Winter Christmas party gathered in the rented holiday home’s kitchen to look on in horrified fascination. A hush fell over the group. 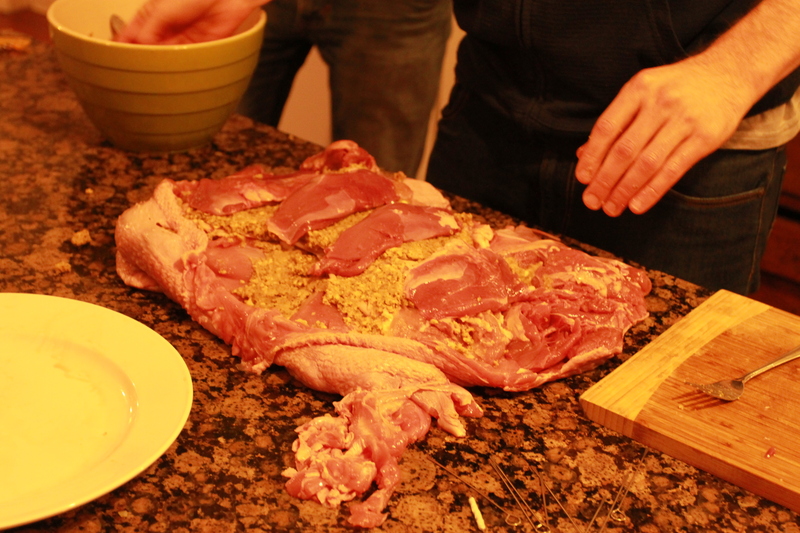 Constructing a turducken is not pretty to watch, but it certainly is interesting. 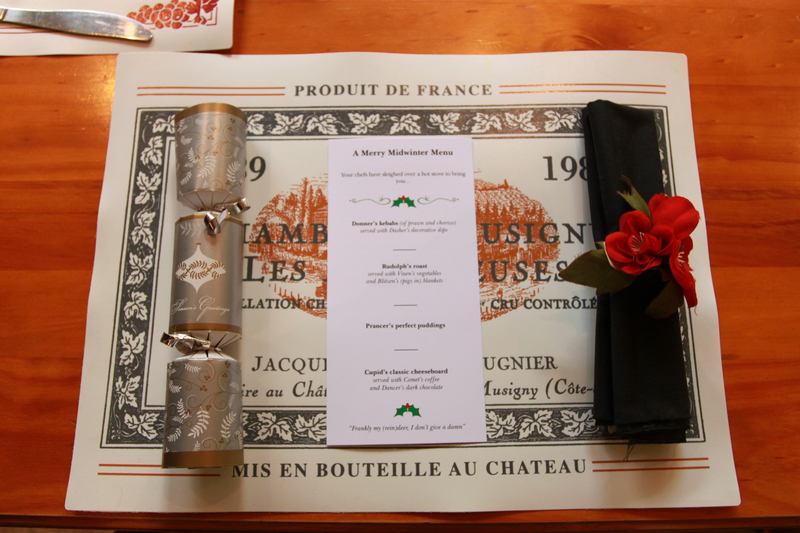 We were blessed with the culinary skills and can-do attitude of Chef and Chief Sommelier Jeremy, who began by splaying out the deboned turkey on the bench and generously slathering the upturned surface with stuffing. Next, the chicken is laid out across the turkey, with more slathering of stuffing, and finally the four duck breasts (de-skinned) are laid out across the top. Here’s the bit where you need the poultry lacer. No, I had never heard of such a thing either, but we concluded it sounded much more sophisticated than’meat needle,’ the name we had assigned to this tool in earlier planning sessions. 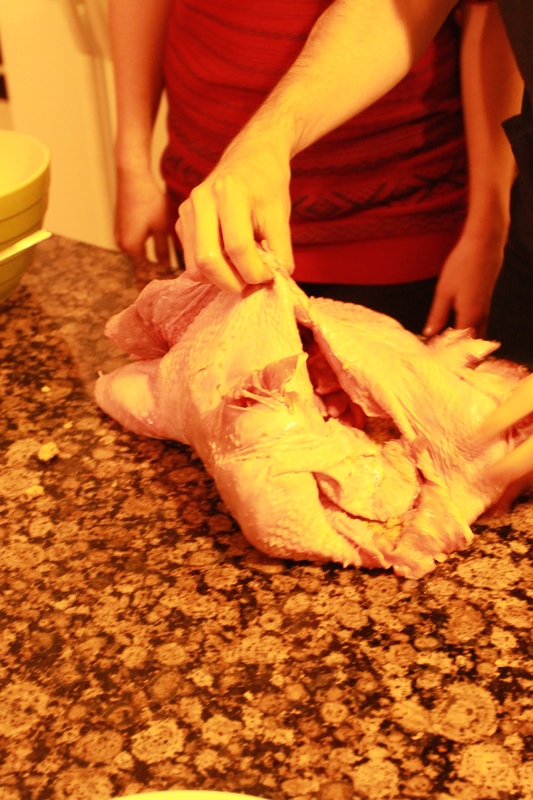 The Frankenducken comes to be when the turkey is sewn back up together with the chicken, stuffing and duck inside. The poultry lacer works a little like a corset, with the metal spikes pinning each half of the unfortunate bird together and providing eyelets for the twine that sews it up. The chef will need some willing helpers at this point. The appearance of the metal spikes and stitching does nothing to dispel any thoughts of Frankenstein’s monster. Here we have our final product, pre-cooking. There was much sniggering, the exact cause of which I will leave to your imagination as you gaze upon this sight. 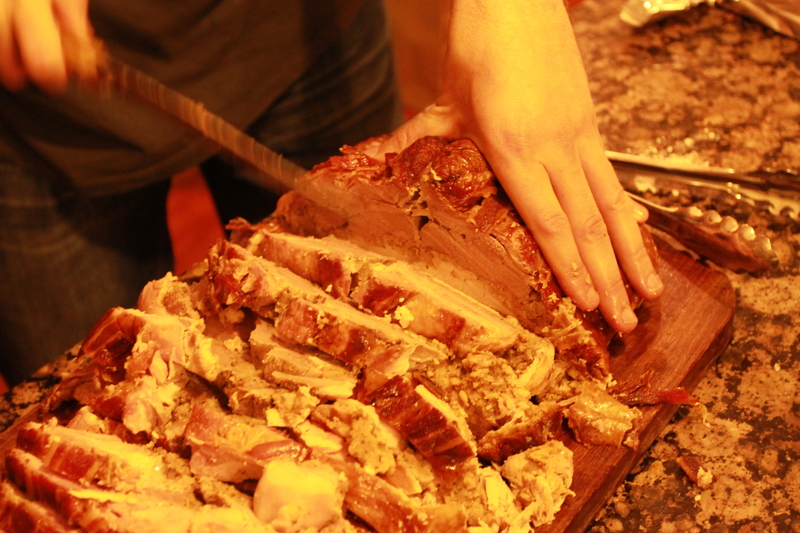 There are a number of schools of thought on how one should cook one’s Frankenducken. My main concern was reliability. 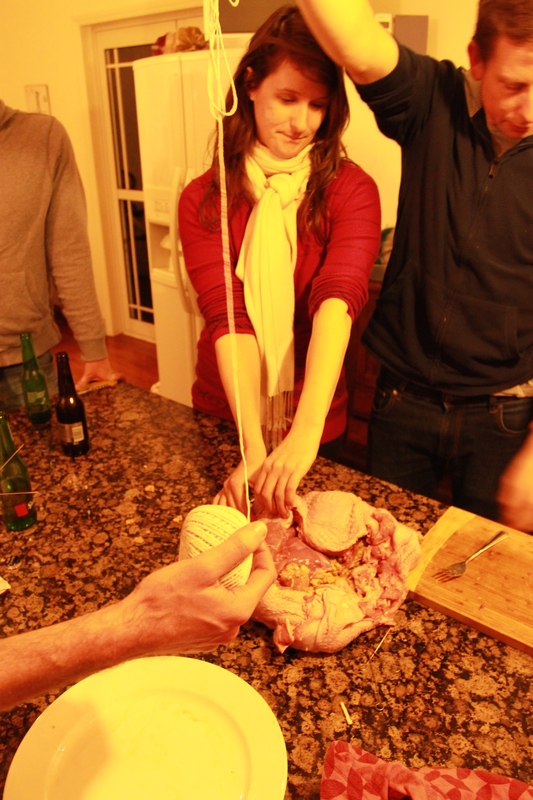 I did not want a raw bird on our hands, nor a house of Christmas revellers struck down with salmonella. And so, I found myself tiptoeing around the kitchen like a little Christmas elf early in the morning, putting our Frankenducken in the oven at roughly 110 degrees celsius. This seemed terribly low to me, but it was most effective. Our turducken took about 4 and a half hours to reach the recommended internal temperature of 165 degrees farenheit and maintained its heat for several hours happily nestled in a layer of foil. Now, for the most important question that is no doubt on everyone’s minds…how did it taste? Quite delicious! 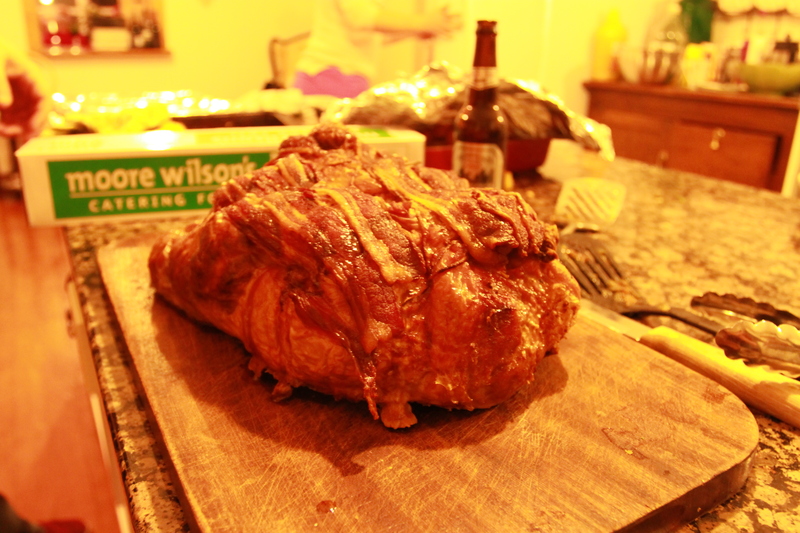 The low temperature cooking left all meat moist and tender, with bacon layers on the turkey breast crisping up pleasingly. I’m wondering if we should try a goose next year.